This paper traces the development in Islamic State administration from the establishment of the Islamic State of Iraq in 2006 until the present day. The paper draws on rare primary sources to explain the growing sophistication in the group's governance structures. The current bureaucratic system has reached a level of complexity and professionalism that probably makes the Islamic State sustainable, even under containment, provided it maintains control of its strongholds. Since the 1980s, jihadist groups have attempted to govern their territories and provide services to locals. Some proclaimed state entities, most often in the form of an Islamic 'emirate': a localized entity that is supposed to be subordinate to the Caliphate. This paper examines the governance structures of the largest jihadi state-building project to date: the Islamic State (IS). For such an entity to function and survive, administration will be a key part of its order. This has been a prominent theme in the Islamic State's own propaganda and one which came to the forefront during the ISIS era. Studying the IS administration is important for two main reasons. For one, Islamic State is a prominent case of the general phenomenon of rebel governance, a topic that remains underexplored in the social science literature and that may hold clues to why some insurgent groups perform better than others. For another, this inquiry can shed important light on the organizational structure and long-term viability of the Islamic State, issues that have direct implications for the policy debate about how the international community should deal with IS. The existing literature has provided descriptive snapshots of the IS administration, but lacks a thorough analysis of its evolution over time. This paper therefore traces the evolution of the administration through its many prior incarnations, beginning with Abu Mus'ab al-Zarqawi's Jamaat al-Tawhid wa al-Jihad (1999), followed by al-Qa'ida in Iraq (Tanzim Qa'idat al-Jihad fi Bilad al-Rafidayn: AQI, 2004), the Majlis Shura al-Mujahideen (2006), the Islamic State of Iraq (Dawlat al-Iraq al-Islamiya- ISI, 2006 post-Zarqawi), the Islamic State in Iraq and al-Sham (al-Dawla al-Islamiya fil Iraq wa al-Sham- ISIS: 2013) and finally the Islamic State (IS: 2014 till present). In the course of this evolution, one goes from a mere group (jamaat) through to an Islamic emirate in ISI, and finally an entity that is now claiming to be the Caliphate. This article attempts to answer these questions by relying on primary IS source documents, and mainly those not released in an official capacity by IS' media wings. These are documents that have been released online by pro or anti-IS activists, or sent to this author in a private capacity. Non-officially-released IS documents are useful because they can shed more critical light on the nature of IS administration. The main limitation here is that the total number of documents unearthed thus far is still likely to be only a small fraction of the total number of administrative documents issued by IS in its various state departments, and ever more granular analysis will have to be reserved for future years, particularly if IS is driven out of its key strongholds and outside forces can seize caches of documents for research. The article is structured chronologically, starting with the first official claim to statehood by ISI in 2006 and continuing right through to the present day. I make two arguments: first, the documentary evidence represents a growing sophistication over time, and second, the current model seems sustainable and resistant to internal collapse if IS control of its strongholds is allowed to continue. In this regard, I dissent from the assessment of Jamie Hansen-Lewis and Jacob Shapiro that "from an economic perspective, Daesh [IS] is extremely unlikely to be sustainable." This is not to portray IS as having a model economy, but rather to say IS can probably sustain control over its territories because the quality of life there was low to begin with. As noted above in the summary timeline, the transition to ISI in 2006 headed by Abu Omar al-Baghdadi represents a key turning point in self-presentation: from a mere group to an actual state. Concomitant with this change in official image was the establishment of the first cabinet of ministries in April 2007. These ministries were as follows: first ministry, war ministry, public relations ministry, public security ministry, media ministry, oil ministry, Shari'a Committees ministry, martyrs and prisoners ministry, agriculture and fishing ministry, and health ministry. In keeping with the notion of good governance, an image of technocratic government was presented: thus the oil ministry was headed by "the engineer Abu Ahmad al-Janabi," while the health ministry came under the leadership of "the doctor professor Abu Abdullah al-Zaidi." Further, the names reflected to a large extent the 'Iraqization' trend that tried to move away from the image of an unwelcome, foreign jihadi force: thus both the public relations and oil ministers are Janabis (associated with Iraqi Sunnis), the media minister a Mashhadani (from a Sunni area of north Baghdad), and the martyrs and prisoners an Issawi (from Anbar). The main exception in this regard was Abu Hamza al-Muhajir, the war minister, an Egyptian by origin. However, it is naturally questionable how far these ministries translated to real administration on the ground. Indeed, ISI seemed to acknowledge as such in a tract entitled "Informing the People About the Birth of the Islamic State," a study released by ISI in 2006-7 under the supervision of Shari'a Committees official Uthman bin Abd al-Rahman al-Tamimi. The treatise cites a number of Islamic texts to justify the necessity of establishing an Islamic state, and claims that: "After more than three years of jihad in Iraq, the mujahideen have by the granting of success from God been able to reach an appropriate level of organizational, military, administrative, economic and media capabilities and preparations that they have not attained before." Yet "despite the fact that we say this, we realize completely that the basis on which the Prophet...relied in the establishment of his first state did not possess the supreme fields of knowledge, worldly specialties, and material capabilities of that time, but rather his enemies were far ahead of him in this regard, but that was not a reason to put a stop to the destiny of the state and its project." That is, ISI was already acknowledging its own limitations in functioning as an actual state but used Islamic precedent to justify the legitimacy of its declaration. This problem was compounded by the rise of the Sahwa (Awakening Movement) among Iraq's Sunnis, which in coordination with coalition forces played a crucial role in 'rolling back' ISI over the period 2007-2009, though not destroying or defeating the organization entirely. Rather, as Brian Fishman puts it, the net effect of the surge and the Sahwa was that these developments "pushed it out of its former safe-havens and inhibited its ability to hold territory." In September 2009, ISI announced its second appointment of cabinet of ministers, acknowledging its losses since 2007 in a video release: "After the announcement of the first Islamic government, the Islamic State has been subjected to painful stabs from every side, but has endured over the wounds, has taken heart over the pains and has recovered, and has arisen on the leg of earnestness for jihad in the path of God and defending the religion of God." The second cabinet of ministers comprised first and war ministries, Shari'a committees, public relations, prisoners and martyrs, security, health, media, oil and finance. The names of the ministers are different from the first cabinet except for the appointment of Abu Hamza al-Muhajir in combined roles as first and war ministers. Despite the severe weakening of ISI capabilities, the group remained capable of carrying out deadly terrorist attacks, and reports of ISI entrenching itself in Mosul as a criminal enterprise extorting money from businesses, together with ongoing oil smuggling, were already becoming apparent in 2009. These problems only continued and intensified as Abu Bakr al-Baghdadi became new ISI leader by ISI Shura Council appointment in May 2010 following the deaths of Abu Omar al-Baghdadi and Abu Hamza al-Muhajir and as the U.S. troop presence drew down. In September 2011, the Iraqi-German investigative outlet Niqash reported that every pharmacy owner paid between 100 and 200 dollars a month to ISI, while contractors paid 5-10% from every contract assignment to ISI: extortion also came upon hotels, doctors, and shopkeepers. The pervasiveness of the enterprise readily casts into doubt the central government's real control over Mosul during these years. It is a significant aspect of ISI's deep entrenchment in Mosul and the wider Ninawa province, coming not only at the expense of Baghdad but also ISI's rival insurgents, many of whom also had an established presence in Mosul but lacked ISI's financial resources and operational capabilities. These rivals included the jihadist Jamaat Ansar al-Islam and the Ba'athist Jaysh Rijal al-Tariqat al-Naqshbandia. Though ISI was in no position at the time to subjugate these groups totally, the point about entrenchment partly explains why ISI's successor ISIS so quickly became the dominant power in Mosul following the city's fall in June 2014. In sum, by 2011 it would still not have made any sense to characterize ISI as an actual state even as Mosul and Ninawa province had clearly emerged as its main hub, but rather its status was akin to a Mafia organization, not yet governing any major towns or territory where it could display the workings of most of its supposed government ministries. The self-presentation as a state is in any case important for understanding an ideological basis for ISI and its successors' disputes with rival groups that did not make claims to being an actual state: since ISI and its descendants already saw themselves as being of a higher status, independent arbitration of disputes and compromise would be impossible in the long run. These problems became much more apparent with the expansion of ISI into Syria and the declaration of ISIS in April 2013, after which the first real signs of proto-governance began to emerge. The outbreak of the Syrian insurgency in 2011 provided ample opportunity for ISI to expand and establish a safe haven, which would later prove beneficial to campaigns on the home front in Iraq. From this outlook came the birth of Jabhat al-Nusra sometime in summer 2011 as Abu Muhammad al-Jowlani (of Syrian origin) was dispatched along with a number of ISI operatives into Syria. The question of whether this decision to expand into Syria was made in coordination with al-Qa'ida Central (AQC) remains controversial and part of an ongoing 'war of the narratives': in what is now the Islamic State's telling, it was wholly the work of ISI as there was no allegiance to AQC anyway since 2006, while AQC and its supporters insist that ISI leader Baghdadi had affirmed his allegiance to AQC and authority ultimately lay with AQC leader Ayman al-Zawahiri. Regardless, it is not in the scope of this paper to delve in-depth into this subject. Unsurprisingly, the route of migration into Syria appears to have been the Ninawa-Hasakah corridor, again reflecting Ninawa's status as ISI's main hub in Iraq. Indeed, it was also used by Jama'at Ansar al-Islam to establish its own Syrian branch, with the al-Qaa'qaa' training camp set up in al-Hewel in Hasakah along the border with Iraq. However, the strategy of Jabhat al-Nusra was quite different from ISI and did not involve claims to statehood. Instead, the group aimed to intertwine itself with the broader rebellion, coordinating with most other factions. It remained open to power-sharing in areas captured from the regime, while providing services and da'wah outreach to locals. Pursuing this gradualist approach, Jabhat al-Nusra gained widespread legitimacy as a valuable asset to the rebellion, even as U.S. intelligence correctly identified it as originating from ISI, hence the terrorist designation in December 2012. In turn, Jabhat al-Nusra's success in Syria, combined with a desire to prevent the group from seemingly becoming too powerful to stand up for its autonomy, is likely what prompted Baghdadi's calculation to announce unilaterally via al-Furqan Media the merger of ISI and Jabhat al-Nusra to form ISIS in April 2013, although there had probably been a good deal of agitation behind the scenes prior to the audio message. With the rejection of the merger by Jabhat al-Nusra and AQC, Baghdadi nonetheless persisted with his ISIS project, winning over a number of defecting Jabhat al-Nusra factions to build an ISIS presence in northern Syria. The most significant losses for Jabhat al-Nusra to ISIS were in Raqqa province, but what had clearly emerged as Syria's official al-Qa'ida affiliate retained the loyalty of virtually all its contingent in Deraa province in the far south. It is at this stage, in the spring of 2013, that the first signs of ISIS administration emerge. It is important to recognise here that the ISIS strategy for expansion also entailed a degree of gradualism, as in the majority of places where ISIS had a presence it was only one among multiple factions. Central to the first stages of an ISIS presence in a given area was the establishment of a da'wah office, which would not only function as a means of social outreach and recruitment of members of the local population, but also as a front for gathering intelligence on ISIS rivals in the local area, plainly with the intention of undermining and destroying them. This approach was recently the subject of an article by Der Spiegel reporter Christoph Reuter, who attributed it to blueprint plans purportedly written by Baghdadi's deputy Hajji Bakr. The plans also envisaged a sophisticated security apparatus in each of ISIS's regions. Regardless of whether these plans actually guided ISIS strategy, there is no denying the importance of the da'wah office to the growth of ISIS in 2013. Two notable cases are the towns of Raqqa and Azaz. In the former, ISIS co-existed with Ahrar al-Sham, Ahfad al-Rasul (which ISIS expelled in August 2013 while Ahrar al-Sham largely stood by) and Jabhat al-Nusra (which 'returned' in September 2013). Here, ISIS became known for its da'wah office that erected billboards in the city advertising its ideals, such as the need for women to dress modestly, the importance of implementing God's law, not man-made law, and so on. The da'wah office also served as a means to undermine rivals and small protests against ISIS quickly arose in Raqqa to protest the detention of relatives likely linked to rebel factions. Concomitant with the da'wah office and its setting up of billboards was outreach to locals in the mosques, and aiming to give the impression of transparency, ISIS offered to receive complaints about its members' conduct in the Nawawi mosque in Raqqa. In Azaz, which ISIS entered at the beginning of July 2013, the main rival to contend with was the local Northern Storm Brigade, whereas Abu Obeida al-Masri's jihadi faction Jaysh Muhammad in Bilad al-Sham seems to have been quite sympathetic to ISIS, which established a da'wah office in Azaz that recruited from opponents of Northern Storm. At the same time, ISIS was coordinating with Northern Storm in the siege of Mennagh airbase, and the local ISIS amir for the Azaz area- Abu Abd al-Rahman al-Kuwaiti initially had friendly relations with Northern Storm leader Samir Amouri. By September, ISIS felt strong enough to attempt a full-on takeover of the town by force, on the pretext that a German doctor working in Azaz was a spy. Though seeming to accept a ceasefire agreement mediated by Liwa al-Tawhid, ISIS displayed its contempt for independent mediation in violating the agreement and expelling Northern Storm from the town completely, establishing the "Emirate of Azaz" and appointing a local boy – Murad Hallaq – as head of intelligence to hunt down Northern Storm members and supporters who did not repent. The concept of an "emirate" was a key ISIS designation for towns it controlled as strongholds prior to the declaration of the Caliphate, and points to the projection of a forthcoming Caliphate. Quite tellingly, one of the slogans ISIS publicised after the capture of Azaz was: "The promised project of the Caliphate." Another familiar feature of the ISIS presence in a locality where it co-existed with other factions would be the Virtue and Vice Committee/the Islamic Court. For instance, in the northern border town of Tel Abyad, ISIS co-existed alongside Ahrar al-Sham and other local rebel formations, later working together with them to expel the Kurdish militia presence in August 2013. Here, ISIS established an Islamic Court, issuing an edict in December 2013 detailing restrictions on women's clothing. Where ISIS had a presence alongside other factions, Islamic Court could serve as an alternative form of justice to which residents could address their complaints about individuals or members of ISIS, besides being able to license marriages. This was also the case with Deir az-Zor city, where ISIS established its Islamic Court in October 2013. Of course, ISIS Islamic Courts also existed in places where it had strongholds, such as in Azaz and al-Dana. However, it would be wrong to suggest that ISIS administration existed as an entirely separate entity from the wider Syrian insurgent milieu and governing bodies in rebel-held areas. On occasion, one can find joint statements issued with other governing bodies: for example, in November 2013, a joint statement was put out by ISIS, the Shari'a Committee, and the "military council" in the name of the "Free Syrian Army," calling on the people of Manbij to strengthen the town and area defences against a potential advance by regime forces. A similar statement can also be found for the town of al-Bab, with joint signatures from ISIS, Ahrar al-Sham and other entities. Nonetheless, the increasingly assertive state-like behaviour of ISIS, such as its attempts to gain monopolies on the making and supplying of bread in a given town, did not escape the attention of already existing administrative bodies, members of whom might be subject to arrest at the hands of ISIS. In this context came a notification in October 2013 from the Shari'a Committee for the al-Bab area, explicitly affirming: "We do not acknowledge the so-called organization of the Islamic State in Iraq and al-Sham as a state but rather as a fighting faction who are brothers to us. To them is our property and upon them is what is upon us." This reportedly came in response to ISIS' arrest of a judge and five other members of the committee who had been seeking out a wanted person, an individual who had pledged allegiance to ISIS and thus sought protection. Similarly, in Manbij, a number of factions including Liwa al-Tawhid, Liwa Fursan al-Furat, and the "revolutionary and military council" issued a statement in late August 2013, declaring ISIS in the town to be a "military faction like the rest of the factions," forbidding interference in any "civil and service matters" and calling on ISIS to respect the authority of the "revolutionary and military council" by handing over any seized public and private property. Despite ISIS' increasingly aggressive behaviour in Syria towards other factions through 2013, the evidence does not justify describing ISIS as an actual state at this point. The group certainly controlled some important strongholds near the border with Turkey as 'emirates' in which some services, legal administration and enforcement of Islamic morality could be provided, but in the majority of places ISIS was only one of a number of factions and had to rely primarily on proselytization to assert itself, while aiming gradually to subvert rival groups. Real territorial holdings tended not to be contiguous and there is no suggestion of a centralized or consistent system of administration to cover the entirety of its areas of control and presence in Syria. The picture was to change with the outbreak of infighting between rebels and ISIS at the start of 2014. It is evident from ISIS' modus operandi in Syria in 2013 that the strategy for expansion and development was considered a slow, step-by-step process premised on the belief that such an approach would avoid a coordinated backlash from Syrian rebels analogous to the Sahwa movement. Initially it worked: After seizing towns such as Jarabulus, Azaz and ad-Dana, ISIS did not face substantial opposition from the rebels as a whole. Frequently, ISIS coordinated with other factions during offensives in Latakia, Qalamoun and Aleppo province, and those of Islamic Front and jihadi orientation in particular were reluctant to turn against ISIS openly, and ISIS sometimes played on notions of 'brotherhood' in holding joint da'wah meetings with Jabhat al-Nusra and Ahrar al-Sham in Aleppo under the auspices of Sheikh Abdullah al-Muhaysini. However, continued ISIS encroachments, coupled with the killing of Abu Rayan—a widely respected figure from Ahrar al-Sham—quickly escalated into widespread infighting across northern and eastern Syria between ISIS and other factions, such that even Jabhat al-Nusra actively fought against ISIS. The only exceptions were localized: the Qalamoun area and (for a brief time) the far north Hasakah province. The infighting also led to the official disavowal by al-Qaida Central of any links with ISIS. A good deal of exaggeration continues to surround the scale of the infighting. The end result was a redrawing of positions in which ISIS withdrew from Idlib, Latakia, Hama and Deir az-Zor provinces, consolidating its territory around Raqqa city—which would become its de facto capital—as well as southern Hasakah province and eastern Aleppo province. In analytical terms, however, this redrawing of positions should not be viewed as representing significant defeats for ISIS, but rather a shift in strategy focusing on the control of contiguous territory and strongholds, contrasting with the previously thin spread in which ISIS was only one of a number of factions in the vast majority of places it had a presence. The 2013 approach for expansion was now obsolete. The regrouping in Syria also coincided with the beginnings of major expansion in Iraq, where ISIS coordinated with other insurgent groups to seize control of Fallujah. In Fallujah, ISIS adopted the same gradual subversive strategy it had employed in Syria, setting up an Islamic Court in the city and eventually dominating the city through assassinations of rivals, seizures of weapons caches and outreach to locals. In Syria though, the need to subjugate rivals in the new strongholds demanded first and foremost the securing of loyalty through official demonstrations of repentance, and many of the administrative documents in this period focus on this issue. Together with repentance comes the issue of ideological affinity with ISIS. Thus, for example, we have from a newly developed Diwan al-Awqaf (a department dealing with religious matters: in this case also the 'Diwan Khidamat al-Muslimeen'- Muslims Services Department) in al-Bab a document for the affirmation of faith, declaring rejection of all other religions except Islam, rejection of Assad and rejection of Sufism. With the consolidation of territory and strongholds also comes the emergence of more state-like institutions. For example, in the realm of education, ISIS began setting up Shari'a Institutes, including for women, appearing to be tied to da'wah offices. Moreover, implementation of Islamic law at a stricter level than in the 2013 era becomes apparent. 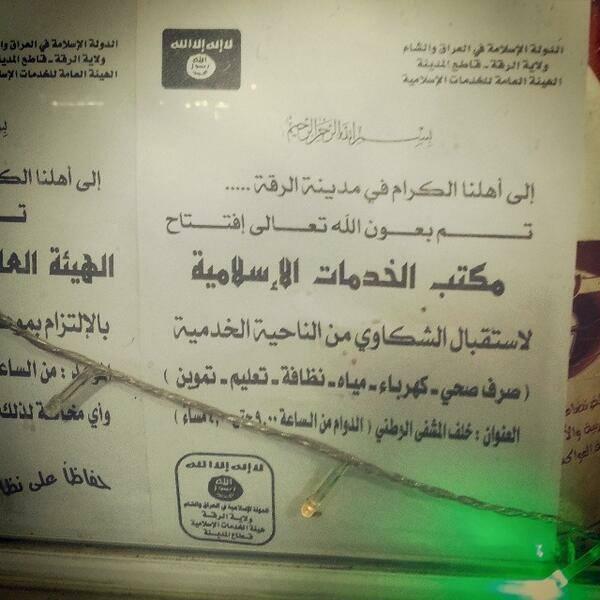 In March 2014, ISIS in al-Bab issued a statement obliging shops to close during prayer time. Further, in the Manbij area of the eastern part of Aleppo province, ISIS issued a statement in February 2014 prohibiting gender mixing, particularly in schools, institutes and colleges, giving officials in these bodies a deadline of a week to comply. The signature in this case is that of Abu Luqman, who, as noted by the NGO Raqqa is Being Slaughtered Silently, was appointed by ISIS to manage affairs in eastern Aleppo countryside after the regrouping in the wake of the infighting. The following month, ISIS' Islamic judiciary in al-Bab introduced a list of hudud punishments for various crimes, including 80 lashes for consumption of alcohol, the death penalty for blasphemy, amputation of hands for theft, and the possibility of death penalty and crucifixion for highway robbery. The display of these harsh forms of justice first gained notoriety in Raqqa in April 2014 with the killing and crucifixion of men accused of planting IED bombs against ISIS, meriting the punishment of crucifixion according to Qur'an 5:33. ISIS' ambition to develop public services also becomes more apparent. In Raqqa during 2013, ISIS had more or less left alone the local council that came into being after the fall of the city from regime control to manage the realm of the public services of water and electricity, but with the ISIS takeover of the city, the local council appears to have been subject to co-optation and reformation at the hands of ISIS. They also established Islamic Services Committees to oversee electricity supply, health spending, education, street cleaning, and food provision. Again, reflecting a certain concern for good governance, ISIS opened an office for this committee in April 2014 to which residents in Raqqa could address complaints. In a similar vein, in its Aleppo province stronghold of Jarabulus, ISIS set up a public services administration building in May 2014. Meanwhile, in Iraq, ISIS' ever growing assertiveness saw da'wah outreach in mosques and in the open to locals in certain parts of the country. 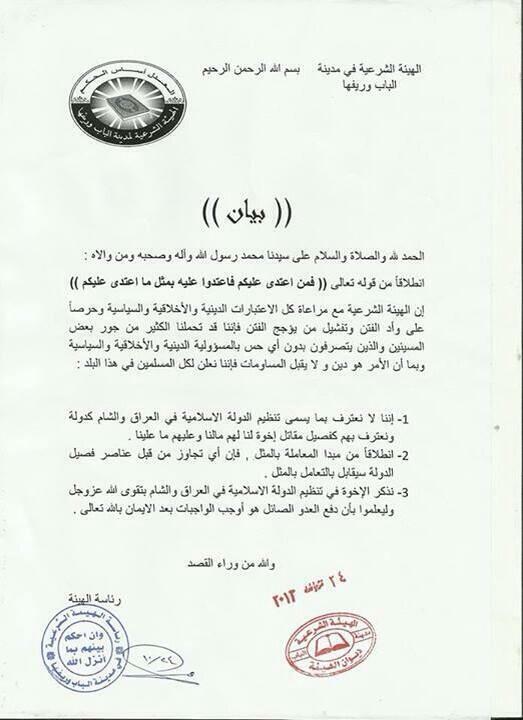 Further, a shadowy ISIS "Shari'a Committee" in Mosul issued various political statements, such as the call for residents not to vote in the 2014 parliamentary elections. In August 2013, this committee also issued an injunction against shops selling inappropriate dress for women. Thus, the aftermath of the infighting with Syrian rebels actually saw the further entrenchment of ISIS and growth in its state-like presentation, moving beyond the heavy focus on da'wah outreach and intelligence subversion and now assuming more characteristics of a real state, with more extensively claimed provision of public services and stricter enforcement of its ideals of morality and public conduct. That said, the extent of service provision was not the same across all ISIS territories, and an element of centralization and coordination seems somewhat lacking. This was to change with the rapid ISIS advances across northern and western Iraq in the summer of 2014, beginning with the fall of Mosul, and the acquisition of significant contiguous territory spanning the borders of Iraq and Syria, ultimately prompting the declaration of the Caliphate at the end of June 2014. After the declaration of the Caliphate, documentary evidence shows the emergence of various so-called Diwans: institutions corresponding to government departments or ministries. The image of governance presented is accordingly much more comprehensive, pointing to local administrations of various realms of daily life that may also answer to higher central departments whose authority in the issuing of edicts should span the entirety of Islamic State territory. Table 1 represents various Diwans that can be identified, with a brief description of each Diwan's functions. Beyond the Diwans, there were other government bodies of note, such as the General Supervisory Committee that seems to have the authority to issue general notifications to the various Islamic State provinces, such as a ban on GPS and Apple devices in December 2014. Fatwas, textbooks for training camp recruits etc. The Diwan al-Ta'lim perhaps illustrates best the point about notions of a centralized administration with representations at the local (i.e. provincial and regional-provincial) level. The central Diwan al-Ta'lim is currently headed by a figure known as Dhu al-Qarnain, a German citizen of Egyptian origin who was part of the original Abu Mus'ab al-Zarqawi network in Iraq. The decision to outlaw the teaching of certain subjects in schools and other educational institutions across the provinces, as well as the announcement of job opportunities in education across the provinces and the marking of the beginning of the next academic year, all bear his signature in the documentary evidence. The Diwan al-Ta'lim may have to decide at the local level (for example) what the registration fees for schools in a certain area will be, but the question of curriculum has already been definitively determined by Dhu al-Qarnain. Similarly, the Diwan al-Amn at the central administration level issued the notification to all the provinces calling for the killing and wounding of Jordanian pilots after the advertised burning alive of Muadh al-Kasesbeh, but this Diwan also exists at the provincial level and can make decisions based on the local circumstances. In Ninawa province in Iraq, for example, the Diwan is keen to monitor Internet shop users and has demanded that shop owners seek the four Iraqi ID documents from them and have them verified so they can be presented to the local Diwan on requirement. The ID documents only make sense in the Iraqi context, not spanning the whole Caliphate. Contrasting somewhat with the Diwan al-Ta'lim and the Diwan al-Amn, the Diwan al-Ifta' wa al-Buhuth is by nature a single, centralized body, issuing fatwas for the notification of all inhabitants of the Islamic State, dealing with a variety of questions such as the permissibility of eating meat imported from Turkey and playing table football. With this structure, the declared Caliphate looks a lot more like a real state than its ISIS predecessor. Indeed, the sheer range of documents that has emerged over the past year covers a broad range of domains, including regulations on fishing, tax forms for electricity services, licenses for excavation of antiquities, phone subscriptions, fees for sanitation services, agricultural crop plans, unified Friday sermons, vaccination programs, and fixing rent rates for property. Of course, the documents cannot be taken simply at face value and deserve critical analysis on a case-by-case basis. Take the Diwan al-Sihha: the vaccination programs on offer in Syria may seem superficially impressive, but in fact they do not differ from the already existing system under the regime. The Diwan al-Ta'lim-issued exam timetables for Mosul University do not reflect a reinvigorated university system but rather a change of education department label with a shrinking of the university through closure of certain departments. Likewise, when it comes to services offices, the issue is often not so much a complete overhaul at all levels by the Islamic State, but rather the already existing employees of those offices in a given city/town (e.g. Mosul) are compelled to work under threat of confiscation of one's home and thus come under the label of Diwan al-Khidamat. On the other hand, the requirement to work helps win support from local residents unhappy with inefficient public services under the Iraqi government. Even so, IS is helped considerably by the fact that the central government continues to pay the salaries of public employees in IS-controlled areas. Whatever the shortcomings of Islamic State administration, we can see an evolution over time from a criminal organization subsisting on extortion, into a group controlling pockets of territory and primarily relying on da'wah activity and subversion of rivals, and finally becoming an entity controlling large swathes of territory and major towns spanning the Iraq-Syria border with a diverse range of bureaucratic departments. The current situation presents IS' opponents with several challenges to consider. First, the harsh justice and rigid security apparatus help bring a sense of order to areas in Syria especially that have known little but the chaos of war and competing factions for the past four years. This has severely blunted the prospects of internal opposition undermining the Islamic State's rule from within. Local rivals, such as the Shaitat tribe in Deir az-Zor province, are put down with ruthless efficiency, as the Islamic State's tribal outreach embodied in its Diwan al-Asha'ir can also play off members of the same tribe against each other. In Iraq too, local opposition is not forthcoming: we are no longer in the era of the Iraq War when other powerful insurgent factions existed, many of whose members went on to constitute the Sahwa forces. Instead, through a mixture of coercion and co-optation, those other factions have virtually ceased to exist on the ground. Second, the extent of state administration provides abundant avenues for revenue, above all in the form of taxation. Whether one considers school registration fees, fines for traffic violations, paying for garbage disposal or jizya taxes in Raqqa, sources of revenue clearly go far beyond the conventional descriptions of a criminal outfit primarily making money through smuggling of oil and antiquities. Indeed, the Islamic State has incorporated the fields of oil and antiquities into its bureaucracy. Thus, disruption of oil infrastructure through airstrikes may reduce Islamic State revenues, but it does not seem to have fatally undermined its finances: rather, it can easily resort to greater taxation to compensate, as recent anecdotal evidence seems to suggest. Seriously hurting IS economically would require one of two things: either a large-scale, casualty-heavy bombing campaign targeting IS infrastructure or alternatively, the complete sealing off of IS from the outside world. Both seem currently unfeasible, the former for political reasons, the second for practical ones, though with regard to the latter, there may be some merit to Shapiro and Hansen-Lewis' suggestion that the Iraqi government should compensate government employees in IS-held areas in "goods which are less liquid than cash" as a way to stifle IS income without virtually depriving the population of its livelihood. To sum up, IS appears to have set up an administration that is very sophisticated as far as rebel groups go, one that is capable of enduring for years unless subjected to direct military attack. At the same time, it is difficult to see how this bureaucracy can develop much further in Iraq and Syria given the many pressures and constraints on its resources and communications. There is some potential for bureaucratic development in IS's provinces outside of Iraq and Syria, but challenges remain there too. At the moment, then, it would seem that IS bureaucracy is remaining, but not expanding. About the author: Aymenn Jawad al-Tamimi is Shillman-Ginsburg Fellow at the Middle East Forum. Examples include the Jamaat al-Da'wa that proclaimed an Islamic emirate in Kunar, Afghanistan that lasted from 1989 to 1991, the Taliban's Islamic Emirate of Afghanistan that controlled most of the country from 1996 to 2001, and more recently the Caucasus Emirate project and the 'Emirate of Waqar' set up by al-Qa'ida in the Arabian Peninsula front group Ansar al-Shari'a in Yemen; see Brynjar Lia, "Understanding Jihadi Proto-States," Perspectives on Terrorism (2015), ; and "The 'Ansar al-Shari'a' group disposes of the corpse of a man it executed on accusations of betrayal," Aden al-Ghad, February 15, 2012 (http://adenghad.net/news/7591/%5cgoldmohurhotel.com#.VZAAUPmqqkp). Clint Watts, "The U.S. Can't Destroy ISIS- Only ISIS can Destroy ISIS: The Unfortunate Merits of the 'Let Them Rot' Strategy," FPRI Blog, September 2014 (http://www.fpri.org/geopoliticus/2014/09/us-cant-destroy-isis-only-isis-can-destroy-isis-unfortunate-merits-let-them-rot-strategy). E.g. Aaron Zelin, "The Islamic State of Iraq and Syria Has a Consumer Protection Office," The Atlantic, June 13, 2014 (http://www.theatlantic.com/international/archive/2014/06/the-isis-guide-to-building-an-islamic-state/372769/). "Announcement of Ministry Formation for the Islamic State of Iraq," al-Furqan Media, April 19, 2007 (https://archive.org/details/The_Islamic_State_of-Iraq). Cf. Brian Fishman and Douglas Ollivant, "State of Jihad: The Reality of the Islamic State in Iraq and Syria," War on the Rocks, May 21, 2014 (http://warontherocks.com/2014/05/state-of-jihad-the-reality-of-the-islamic-state-in-iraq-and-syria/). This piece also references the treatise and its acknowledgments of the on-the-ground limitations of ISI as a state at the time. Brian Fishman, "Don't BS the American people about Iraq, Syria and ISIL," War on the Rocks, August 20, 2014 (http://warontherocks.com/2014/08/dont-bs-the-american-people-about-iraq-syria-and-isil/). "Second Ministry Formation for the Islamic State of Iraq," al-Furqan Media, September 21, 2009 (https://archive.org/details/Al-Tashkeelah-2-Le-Dwla-Iraq-Islamic). E.g. Deepa Babington, "Suicide attacks down, extortion up in Iraq's Mosul," Reuters, November 27, 2009 (http://www.reuters.com/article/2009/11/27/idUSGEE5AP1ZF). Though ISI is not mentioned by name in this report, it is clear ISI is behind the extortion demands. "ISI organization names a new leader," Reuters Arabic, May 16, 2010 (http://ara.reuters.com/article/topNews/idARACAE64F06S20100516). Aaron Zelin, "Al-Qaeda Announces an Islamic State in Syria," Washington Institute for Near East Policy, April 9, 2013 (http://www.washingtoninstitute.org/policy-analysis/view/al-qaeda-announces-an-islamic-state-in-syria). Rania Abouzeid, "The Jihad Next Door," Politico, June 23, 2014 (http://www.politico.com/magazine/story/2014/06/al-qaeda-iraq-syria-108214.html#.VXMEc8-qqko). Aymenn Jawad Al-Tamimi, "The Life of Abu Muhammad al-Muhajir: A Founder and Commander of Jamaat Ansar al-Islam in Bilad al-Sham," August 30, 2014 (http://www.aymennjawad.org/2014/08/the-life-of-abu-muhammad-al-muhajir-a-founder). "Terrorist Designations of the al-Nusrah front as an Alias for al-Qa'ida in Iraq," U.S. Department of State, December 11, 2012 (http://www.state.gov/r/pa/prs/ps/2012/12/201759.htm). Christoph Reuter, "The Terror Strategist: Secret Files Reveal the Structure of the Islamic State," Der Spiegel, April 18, 2015 (http://www.spiegel.de/international/world/islamic-state-files-show-structure-of-islamist-terror-group-a-1029274.html). Aymenn Jawad Al-Tamimi, "The Islamic State of Iraq and ash-Sham Billboards in Raqqa," Jihadology, October 22, 2013 (http://www.aymennjawad.org/13960/the-islamic-state-of-iraq-and-ash-sham-billboards). Aymenn Jawad Al-Tamimi, "Special report: Northern Storm and the Situation in Azaz," Middle East Review of International Affairs, January 2015 (http://www.aymennjawad.org/15865/special-report-northern-storm-and-the-situation). ISIS Statement ('Wilayat Deir az-Zor', before the name change to 'Wilayat al-Kheir'): http://documents.sy/image.php?id=2458〈=ar. In Azaz, the Islamic Court was situated in the building that now houses the town's Islamic/Levant Front-affiliated Shari'a Committee. Interestingly, the spokesman for Northern Storm also claimed to this author that ISIS had its own special Islamic court in the same building as its da'wah office prior to the takeover of Azaz. Joint statement, November 5, 2013 (https://pbs.twimg.com/media/BYVBlp0CEAARW_V.jpg). E.g. "ISIS fighters have seized the flour mills in the town of Manbij in Aleppo province," El Dorar, September 5, 2013 (http://eldorar.com/node/23881). Statement from "Shari'a Committee for al-Bab and its Countryside," October 24, 2013 (https://pbs.twimg.com/media/BXdEMAiIIAAaQhj.jpg). "Shari'a Committee in the town of al-Bab in Aleppo announces it does not acknowledge the Islamic State in Iraq and al-Sham," Halab News, October 24, 2013 (http://halabnews.net/news/40719). "The Revolutionary Military Council in Manbij considers the Islamic State a faction like the rest of the military factions," Halab News, August 26, 2013 (http://halabnews.net/news/34583). E.g. "The brothers Dawla, Jabhat and Ahrar," October 2013 https://twitter.com/ajaltamimi/status/394130767371964417. "ISIL tortured to death Ahrar al-Sham commander in Aleppo," Zaman al-Wasl, January 1, 2014 (https://en.zamanalwsl.net/news/3111.html). Archive of Islamic State Administrative Documents, Specimen 1N (http://www.aymennjawad.org/2015/01/archive-of-islamic-state-administrative-documents). ISIS Statement in Manbij area, February 27, 2014 (https://pbs.twimg.com/media/Bhk0dd1IYAA07eB.jpg). "Abu Luqman...changing the name with changing the mission entrusted to him by ISIS," Raqqa is Being Slaughtered Silently, April 13, 2014 (http://www.raqqa-sl.com/en/?p=965). List of hudud punishments from Shari'a judge for al-Bab area, March 2014 (https://pbs.twimg.com/media/BjmwBGZIIAA3GdI.jpg). Jacob Siegel, "Islamic Extremists Now Crucifying People in Syria- and Tweeting Out the Pictures," Daily Beast, April 30, 2014 (http://www.thedailybeast.com/articles/2014/04/30/islamic-extremists-now-crucifying-people-in-syria-and-tweeting-out-the-pictures.html). "Civil organizations confront ISIS and are subjected to its infringements," al-Sharq al-Awsat, September 4, 2013 (http://archive.aawsat.com/details.asp?section=4&issueno=12699&article=742257#.VXT6eM-qqko). "After its seizure of the city, the 'state' reforms the local council in Raqqa," Zaman al-Wasl, January 16, 2014 (https://zamanalwsl.net/news/45545.html). ISIS statement, Raqqa city area, April 2014 (https://pbs.twimg.com/media/BlREcahCcAA93Bm.jpg). "Preparation of the public services administration center in the Jarabulus area," ISIS Wilayat Halab, May 2014 (https://twitter.com/ajaltamimi/status/468837213980332032). Aymenn Jawad Al-Tamimi, "Aspects of Islamic State Administration in Ninawa Province: Part III," January 23, 2015 (http://www.aymennjawad.org/15961/aspects-of-islamic-state-is-administration-in). Archive of Islamic State Administrative Documents, Specimen X. Ibid., Specimens Z and 4O. Ibid. Specimen 4F with explanatory note in the archive. Aymenn Jawad Al-Tamimi, "Aspects of Islamic State Administration in Ninawa Province- Part II," January 20, 2015 (http://www.aymennjawad.org/15952/aspects-of-islamic-state-is-administration-in). Saleh Elias, "Services improve under IS in Mosul," Al-Monitor, May 13, 2015 (http://www.al-monitor.com/pulse/originals/2015/05/iraq-isis-mosul-services-sector-improvement-internet-roads.html). Thus most recently, salaries for health workers in Ninawa for the months of February and March 2015 (http://justpaste.it/salariesmosul). E.g. Diwan al-Ta'alaeem in Derna: https://twitter.com/ajaltamimi/status/574555917481418754. However, a concerted push by other Derna rebel factions in June dismantled the IS bureaucracy in the city. "Da3esh demands teachers in Sirte to repent in the 'Diwan al-Ta'aleem'," Afrigatenews, June 1, 2015 (http://www.afrigatenews.net/content/%D8%AF%D8%A7%D8%B9%D8%B4-%D9%8A%D8%B7%D9%84%D8%A8-%D9%85%D9%86-%D8%A7%D9%84%D9%85%D8%B9%D9%84%D9%85%D9%8A%D9%86-%D9%81%D9%8A-%D8%B3%D8%B1%D8%AA-%D8%A7%D9%84%D8%A7%D8%B3%D8%AA%D8%AA%D8%A7%D8%A8%D8%A9-%D9%81%D9%8A-%D8%AF%D9%8A%D9%88%D8%A7%D9%86-%D8%A7%D9%84%D8%AA%D8%B9%D9%84%D9%8A%D9%85). Aymenn Jawad Al-Tamimi, "The Islamic State and its 'Sinai' Province," Tel Aviv Notes, Moshe Dayan Center, March 26, 2015 (http://www.aymennjawad.org/16345/the-islamic-state-and-its-sinai-province).